DEVENS, Mass. — It wouldn’t be Northeast Club Regionals without some surprises. While the final results in the Women’s Division can be called chalk, the journey to the games-to-go turned some expectations on their head. Meanwhile, in the Mixed Division, it was the wild east, as it often is. And in the Men’s Division, Dig had to rally through the backdoor bracket after a loss to GOAT to beat them in the game-to-go. All par for the course in Devens. #4 Boston DiG claimed the second and final bid to Nationals with a 15-10 win over GOAT, who had beaten them on Saturday in the semifinals, in the game-to-go, continuing a long legacy of Boston representation at Nationals in the Men’s Division. Given the team’s performance this season, PoNY’s undefeated run through Regionals doesn’t come as a surprise. New York hasn’t lost since August 4th, winning 14 straight games and three major tournaments — US Open, Pro Championships, and Northeast Regionals — in the weeks since. That doesn’t mean that the win this weekend wasn’t special. Deserve it they did. With an offense that’s firing on an elite level and a defense that’s generated pressure and breaks on teams as good as Revolver, they comfortably defeated GOAT in their only competitive game of the weekend. After early trading, GOAT actually got the game’s first break thanks to a block from Bretton Tan in the endzone to put them up 4-3. However, as they did after each of their two surrendered breaks, PoNY answered with a crisp hold before immediately getting the break back. They wouldn’t trail again. Sam Little notched a run through block and tossed an assist three points later to put PoNY ahead for good. It wasn’t a remarkable game overall for New York. The offense was only broken twice, but they had some execution mistakes — a Ben Jagt huck out of bounds, a jammed throw from Little on a tight window upline — that leave room for improvement. But that’s the difference between this year’s team and past iterations. GOAT struggled to adjust to the varying defensive looks and had a lot of turnovers in the reset space. Speedy cutter Andrew Carroll could never get going as a deep cutter, and GOAT was forced to take lots of short passes and swings, never finding the flow that has made them a dangerous offense in past seasons. Certainly it didn’t help that neither Cam Harris, who left the team before the Series because he couldn’t play at Nationals, nor Ben Burelle, who’s back at school in Vancouver, was available. PoNY, on the other hand, was at full strength and then some. Beau Kittredge, playing with the team for the first time this season, joined the D-line and contributed right away. He was effective on both sides of the disc. PoNY’s win should secure them a top seed at Nationals, likely the #3 overall seed behind San Francisco Revolver and Seattle Sockeye. Saturday’s marquee matchup was the 3 PM semifinal between GOAT and DiG. While not an elimination game, it offered, of course, the chance to play for a Regional title and a smoother path to Nationals. It was a game to forget. Unusually windy conditions made for a lot of ugly offense, and the two teams combined for fifteen breaks. DiG lost 14-12. They were going to have to qualify the hard way. To be fair, the Northeast is thinner outside the ‘Big Three’ this year, and Dig didn’t face a serious threat to get to the game-to-go. But it meant more mileage on their legs. No worries. Coming off of the loss to PoNY, GOAT’s lines seemed even tighter against DiG. Thomson McKnight got an early goal and assist as a part of two clean holds to start, but the wheels fell off. A Jay Boychuk drop set up a wild second chance layout score from the young Ryan Dinger that set the crowd ablaze. DiG backed that up with two more breaks, including one that was set up by a phenomenal Dinger pull to the back of the endzone. Quickly, it was 6-2, Boston. DiG’s offense yielded one of only two breaks to start the second half, but immediately broke back to go back up by four. “It’s not good for morale,” said GOAT coach Sachin Raina. Overall, Boston’s offense was much improved. The less windy conditions surely helped, but so did greater involvement from Tannor Johnson, who was the man of the match. GOAT managed to get back within two at 12-10 but again gave up a quick hold and then back to back breaks to lose 15-10. In their first year as the top Boston men’s team, DiG may not seem like quite the juggernaut that Ironside was during their 10 year run. But that doesn’t seem to bother the team: they don’t feel the pressure of expectations. “I think we’re pretty good at embracing an underdog mentality no matter where we are or who we’re playing,” said captain Noah Backer. It’s hard not to look at the totality of Toronto’s season as a disappointment. Despite bringing back some key veterans like Derek Alexander, Mark Lloyd, and Isaiah Masek-Kelly this season, the team failed to earn a bid and struggled to find a groove. The demands of the season seemed to wear on GOAT. With various players missing time, it never felt that the team was whole. And they left themselves no room for error at their lone competitive USA Ultimate regular season event, the Elite-Select Challenge. A poor Sunday performance left them on the outside looking in at a bid in a region with two top-quality teams. Perhaps there will be some soul-searching after this season, and it wouldn’t be a surprise to see some of the team’s older veterans stepping away from the team. 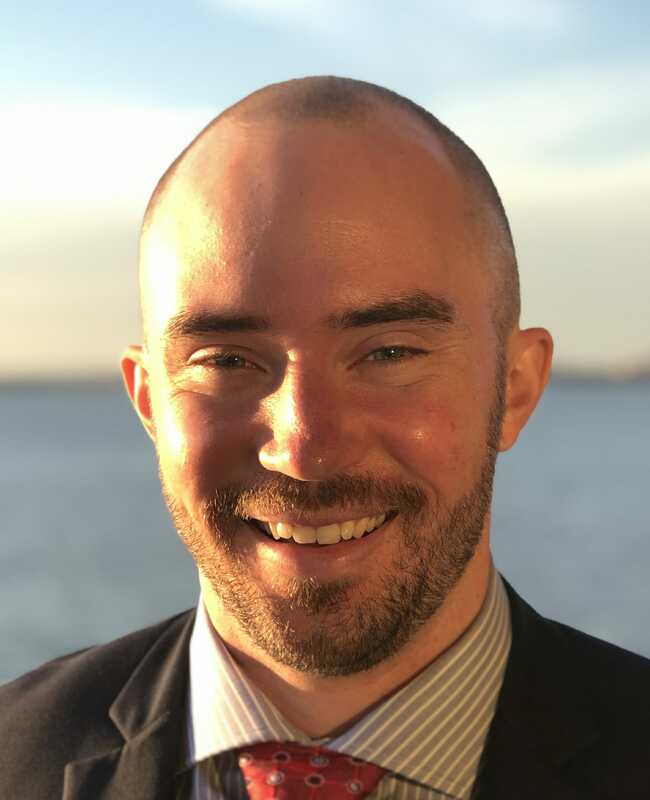 Considering how to better manage the challenges of balancing the USAU season with international commitments and the AUDL will have to be a priority. There are plenty of reasons to be optimistic. The team has clearly shown the ability to be competitive at the highest levels. They were the only team besides Revolver to defeat Colony at WUCC. They had a dominant AUDL season until taking an ugly home loss to New York in the playoffs. 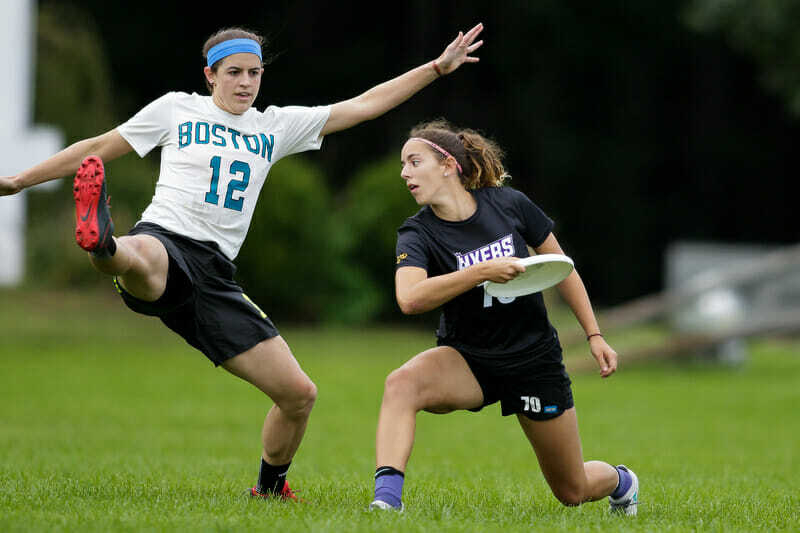 But with New York and Boston as strong as they are, it will take a much more focused effort on the USAU season to get back to Nationals after missing the tournament for the second time in three years. A 30-4 record. An undefeated postseason. A first-year team with buzzy names. Nope — it’s not Space Heater. #7 Boston Snake Country smoothly slithered through Northeast Regionals, never playing a game closer than four points. Due to upsets elsewhere in the bracket, Snake Country never faced off against either of the other two bid earners, Wild Card and Slow White. Snake defeated Metro North 15-11 in the semifinals to earn their spot at Nationals, then beat XIST 15-11 in the final to claim a regional crown in their inaugural season. Rocking Brute Squad lookalike black and green kits with Ironside’s former skull design on the chest (but comprised of miniature snakes) and ‘SSS’ on the shorts instead of Brute’s ‘BOS,’ Snake Country, a team that’s been loosely organized in the past for early season tournaments as a Middlebury alumni team, is now headed to Nationals. “We’ve been talking about playing together for years, and it’s awesome that this has finally come together,” said Prial. There was plenty of Middlebury impact this weekend. Davis Whitehead notched the first break of the game-to-go and Lexi Zalk caught another to send Snake into halftime up a pair. The Snake O-line only got broken once in the game. They beat XIST comfortably twice, once in the crossover, once in the final. Naturally, speculation will start about Snake Country’s chances at Nationals. They’re relatively untested: they had a couple losses to AMP early in the season, they beat a short-handed Space Heater at Chesapeake, and they played a number of good but not great teams at the Northwest Fruit Bowl. With no chance to play Slow or Card this weekend, they’ll be headed to Nationals without a clear sense internally about how they stack up. But there’s no doubt that they are feeling good about their recent play and their chances of doing well in San Diego. New York Grand Army may have been riding high after their stunning 15-10 upset of Slow White in quarterfinals, but #24 New York XIST put a quick end to the party with a 15-8 drubbing to clinch a Nationals berth. XIST jumped out to a quick 3-0 lead and kept the breaks coming as the took half 8-3 while defending and attacking the deep space effectively. XIST was consistently winning their individual matchups and never let Grand Army find a rhythm offensively. Matt Weiner was especially impactful. It was a fortuitous path to a bid for XIST. After getting an important win over Metro North and then losing to Snake Country in crossovers, they only needed to defeat UNION and Grand Army, the no. 11 and no. 13 seeds, respectively, to claim their spot in San Diego. But XIST is a worthy qualifier. They’ve played some good games against top opponents and were competitive at both Pro Championships and the Pro-Elite Challenge. They clearly had the second best weekend among the Northeast teams. They won the games that they needed to win. “If our mental focus is there, we play our best games,” said Chalif. It was too fitting for #5 Boston Wild Card and #9 Boston Slow White to meet in the final game-to-go. After both surprisingly lost their first place quarterfinals–Slow White to Grand Army and Wild Card to Metro North–they were placed on parallel paths, with a maximum of one of the Boston clubs able to advance to Nationals. Their Saturday crossover was a hard fought 15-13 victory for Slow White, turning the record between the two teams over the past three seasons to 6-3 in favor of Slow. The elder program faced their younger neighbor in the 2016 game to go, which they also won. And that’s just since 2016; you could say there’s some history here, much of it filled with close contests. Both offenses came out perhaps nervous, each turning over their first possession. But Wild Card’s Matthew Heath turfed a forehand, allowing Slow White to quickly convert a hammer for the opening hold. Slow White was less generous, exemplified by a Pat Barron handblock on an Alex Evangelides scoober. The ensuing possession concluded on an around backhand that was caught by a bidding Ryan Cardinal for a Slow White break to move the score to 2-0. His defender, Evan Swiatek, also left his feet, and came down on Cardinal’s back, setting the tone for what would be a physical and grinding match. Wild Card was also missing one of their most important offensive players in Ian Engler, who was in and out of the tournament all weekend while on call at the hospital where he is in residency. “He was making a superhuman effort to be present at all, driving back and forth from the hospital,” said Wild Card head coach Mike MacKenzie. Defensive playmaking ruled the day. The next four points featured just two turnovers, both converted for breaks. Gustav Haflin hauled in Wild Card’s, while Pat Barron knocked away a pass under for his second block of the game, leading to a huck to Shaun Doherty and an eventual goal for Doherty at the front cone. After another Wild Card hold, the game was even at 4-4. Barron was a critical defender for Slow White with his ability to create turnovers, but he was overshadowed by the performance of Wild Card’s Connor Fortin. The defender was a brick house, punishing deep shots and creating frequent changes of possession in Wild Card’s favor. Both jump out over a more thankless performance from Baranes, who spent most of the game clinging to Wild Card star Hailey Alm, dramatically reducing her touches on the O-line. “I think we have a few players who match up really well against the players that make Wild Card’s offense run,” said Baranes. While Fortin had a tremendous game, the spotlight really found him with Wild Card trailing 7-6. Two points prior, a throw behind Tamar Austin was dropped, leading to a Slow White break. A huck to Fortin’s offender was slightly misread, and he polished it off with the block. On offense, however, Wild Card caught a pass out of bounds, giving Slow White quality field position. Their handler-driven offense inched towards the goal line, and Eli Motycka wisely took a timeout after too much time had elapsed with stagnant cutting in front him. Out of the break, Slow White ran the dump up the line and swing to the middle, opening up a continue to the opposite front cone. What looked like the hold to take half quickly became Wild Card’s window back into the game as Fortin took flight for a vital block. But he wasn’t done, streaking downfield to sky for a huck, only to tack on the goal himself a few throws later for a dramatic Wild Card break. Slow White soon reestablished their advantage, holding to take half and breaking after a Walker Hatchett block on the third point of the second half, making the count 10-8. After a Wild Card hold, Fortin came up big again, notching a point of blocks before Haflin found room in the end zone for a break to tie the game back up at 10-10. Would you believe if I told you that Slow White decided they would try to huck to Fortin’s matchup when they were in need of a critical hold? You’d definitely believe if I told you Fortin got the block. Again. But Slow White got it back after forcing a short field turnover and held to make it 11-10. In what was a physical game that pushed the envelope, no matchup featured more crashing bodies than Slow White’s Todd Herman versus Haflin. Herman was set up for a deep shot at 11-11, and he made the catch through contact from Haflin. A few throws later, he also caught the goal, absorbing even more contact from a bidding Haflin. After Wild Card held on a series of slim, skillful break throws, Herman was dialed up again on double season point. Alex Trahey fired a backhand to Herman, with Haflin swarming, and Herman caught it as Haflin swatted at the disc and knocked Herman to the ground. The Slow White veteran took an injury–a challenging mental spot just a few yards from a return to Nationals–though he displayed no animosity. After both teams subbed, the disc was tapped in, and a free Slow White player slid upline. A pair of Wild Card defenders desperately double teamed the open look, and Eric Shaw wrapped a forehand around the defense to the inside break lane for a Rachael Westgate goal. Slow White rushed the field and the tears flowed, a deserving conclusion to Northeast Regionals. After their impressive victories over the Boston blue bloods, there was a real shot one of these two could make a run for a reservation in San Diego. Metro North got one of their best wins of the season against Wild Card, 13-12 in quarterfinals. Despite the two big upsets, Grand Army and Metro North couldn’t close the deal. Both were sent to the backdoor by strong semifinal opponents: Snake Country controlled their Metro North matchup, 15-11, while XIST handed a seven point defeat to a Grand Army club that had thrown themselves fully into their quarterfinal upset. Those losses sent both teams to face the opposite side of their quarterfinals victories. But they found two hyper-focused teams with greater depth and a real sense of urgency. Slow White flew past Metro North, 15-9, while Wild Card thumped Grand Army, 15-7, a flat finish after the bubbly beginning of Sunday. #2 Boston Brute Squad captured their sixth straight Northeast Regional title in dominant fashion. While fans probably could have predicted this headline four months ago, the team’s consistency and ability demand respect. No team registered more than seven goals against them in one of the deepest region’s in the division. The most anticipated game of the weekend was the second place game, better known as the final game to go. No. 2 Toronto 6ixers made their way along the path the script indicated, undefeated in pool play, but wholly outmatched in the championship game. However, #23 Ottawa Stella had decided the script would benefit from some rewrites. Their path had led them through #21 New York Bent, who they toppled in a dramatic comeback. The game itself featured some exciting plays, but for most of it, Toronto remained in control. Their inability to convert on their first red zone possession kept things interested, but their O-line displayed defensive tenacity, often earning them other short field chances. Hannah Dawson and Brittney Cooke put forth tremendous efforts, including a spectacular diving score to reel in a huck by Cooke, but Stella lacked the depth and talent along the roster to survive their matchup with Toronto. 6ixers advanced to Nationals with a 15-12 victory. Toronto’s offense might have struggled at points due to the absence of young center handler Anouchka Boudry. She will not compete in the club Series with the team as she focuses on her academic career. The top two performers from the regular season, after Brute and 6ixers, were New York Bent and #22 Boston Siege. Bent sought to return to Nationals, to add to the team’s sporadic appearances, while Siege was attempting to reach the club mountaintop for the first time in the team’s young history. But yet, when push came to shove, it was Stella who emerged as the Top Select squad. Siege and Stella were each dispatched handily in their semifinal matchup, sending both into the backdoor bracket with one last life. However, Stella cleared their Sunday path by upseting Bent in pool play, placing the New Yorkers on the side of the bracket with Siege. Bent took and maintained an early lead on Siege, who struggled to contain Bent in transition, leading to a New York win to the tune of 15-10. But perhaps the shock of the tournament came when Bent rematched Stella. In the calmer conditions of Sunday, Bent’s pace put the Canadians on their heels. With an early lead, Bent nearly needed to maintain control of the game. 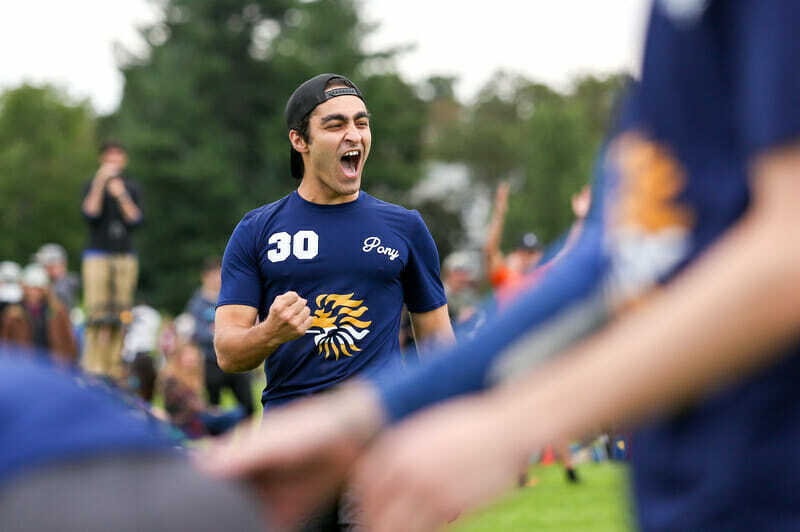 But after falling into an 8-5 halftime deficit, Stella rode their top players–some of them late additions for the final leg of the USA Ultimate season–and roared back to win in sudden death, 14-13. Both Bent and Siege have a lot of talented young players. While there is frustration at missing out on Nationals this year, its easy to see silver linings for both programs. “It’ll be exciting to see them build next year,” added Randall. 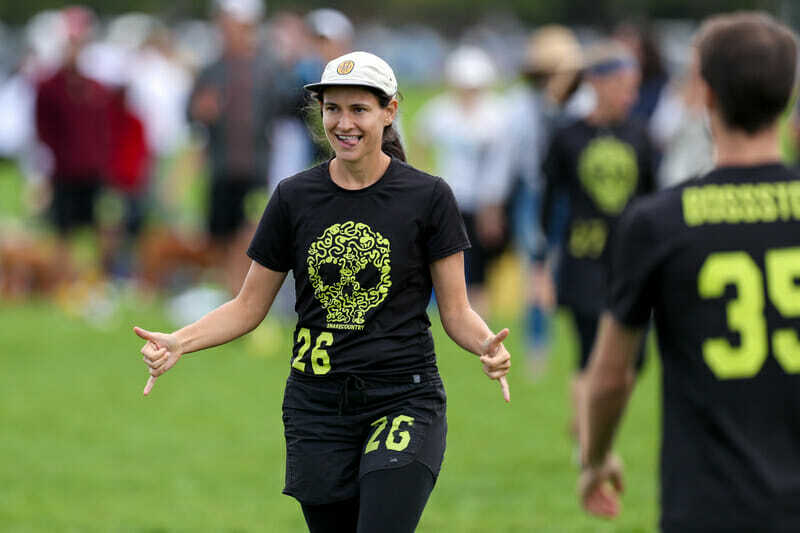 Comments on "Northeast Regionals 2018 Recap: PoNY Wins For First Time, Crazy Sunday In Mixed"